This is Los Angeles. Even the criminals aren’t safe from crime here. A desperate band of armed robbers are a perfect example. They thought they were knocking over a safety deposit vault, but find themselves stalked by a serial killer. It’s too bad O.J. isn’t caught in the crossfire, but he is about the only thing missing from Mike Mendez’s kitchen sink slasher-caper The Last Heist (trailer here), which opens this Friday in Los Angeles. It was probably inevitable that this sleepy bank in an industrial neighborhood would close with the rest of the state’s economy. However, the man in the trench coat who looks like Henry Rollins will be sorry to see it go. As the serial killer known as “The Windows Killer,” he found the out-of-the-way branch to be the perfect place to stash his eyeball trophies. Just as he is packing up, a well-armed team holds up the bank. They seem to be interested in another very specific safety-deposit box. Since only a minimal shift still works at the branch, the Special Forces-trained Paul expected this to be an easy job. You can hardly blame him for not anticipate the Window Killer hiding in the ventilation ducts, preying on his accomplices one-by-one. The heads-up police work of Det. Pascal also hastens a more conventional police stand-off situation. Yet, their greatest problem is the film’s first really big twist. 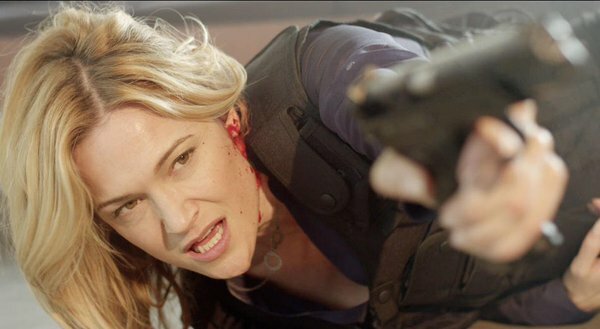 Heist is unabashedly a one gosh-darned-thing-after-another kind of movie. Frankly, Mendez (who helmed the terrifically insane Friday the 31st segment in Tales of Halloween) and screenwriter Guy Stevenson throw us one too many curveballs, ending a somewhat sour note, but up until then, Heist is a delightfully subversive genre hybrid. Rollins is so convincing as the Windows Killer, you might start to suspect he really is a serial killer in real life, which might make a lot of sense. Victoria Pratt is a cool, credibly sarcastic presence as Pascal. Initially, Torrance Coombs does not look like much of a commando-bank-robber, but he seems to grow into the part of Paul. TV veteran John J. York (remember Fox’s late 1980s Werewolf show?) also adds some grit and attitude as Sinclair, the problematic Federal SWAT team leader. Last Heist is probably one of the few products of a high concept brainstorming session that largely panned out. 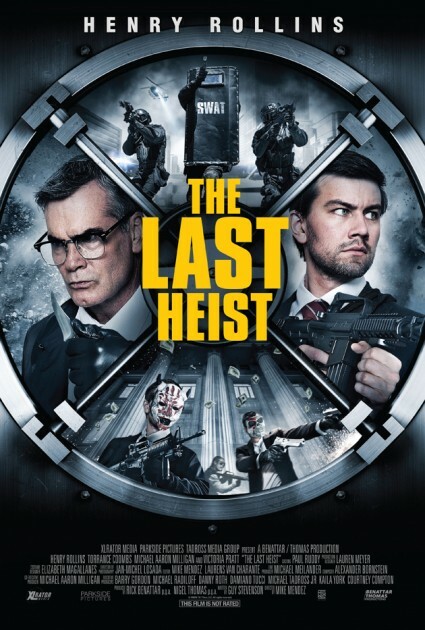 Recommended for its energy and inventiveness, The Last Heist opens this Friday (6/17) at the Arena Cinema.